Magic is real -- and it runs in the family -- in this charming fantasy adventure about a boy who must balance his magical education with the demands of big-brotherhood, perfect for fans of Jenny Nimmo and Angie Sage. Henry Leach the Eighth doesn't know it yet, but he's descended from a long line of wandmakers. That means he has inherited mysterious powers, a trunk full of strange artifacts... and a whole host of problems. His biggest problem at the moment, however, is his little sister, Brianna. She's always had a special talent for getting in his way. And she takes troublemaking to new heights when she's caught in the crossfire of Henry's first major spell! 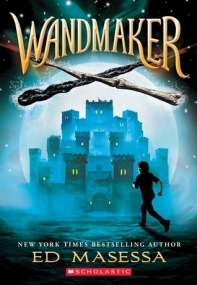 Heartfelt, funny, and imaginative, Wandmaker is sure to leave young readers spellbound. Aiming for the magically inclined, this Middle Grade urban fantasy feels like the start of a series while standing well on its own. Wandmaker is told in third-person from multiple viewpoints, though readers spend the majority of time in the head of the primary young protagonist: Henry Leach. Henry is the 7th son of a 7th son—and from the get-go is clearly a catalyst to the larger story arc. He is kind-natured and ambitious, but largely clueless as to what he’s getting himself into. (Some may appreciate the resulting learn-as-he-goes approach taken with the storytelling.) The vocabulary usage is strong, and the subtle south-eastern Native American elements (more prominent in the 2nd half) add a unique angle of approach. The most robust part of this tale was, by far, the intricacies paid to the creation of wands—including the personalizing and variations thereof. The author initially gained notoriety with the 2006 release of The Wandmaker’s Guidebook, an interactive book and wand-assembly kit. Wandmaker seems to present as an inventive effort to back the existing guidebook with lore. As one might guess by the cover, it’s difficult not to compare this book to Harry Potter. Although, the feel of it is closer to Fablehaven meets the American version of Harry Potter--minus the wizarding school and a large majority of the world-within-a-world. (An extra-special boy with no idea of his chosen-one status, annoying younger sister sidekick, evil magical overlord with a heinous plan, spells that go terribly wrong out of user-ignorance, etc.) Instead you get a crotchety old man in a castle, who loosely heads up a group that adamantly refers to themselves as “Wandbearers” rather than wizards. Harry Potter IS mentioned by name and its author alluded to by the characters within this book, but primarily with the intent of emphasizing all that existing pop-culture got “wrong” about magic. Henry Leach isn’t an orphan, though for the vast majority of this book his parents are basically a non-factor. Despite the fact that they both have been involved in the magical side of their reality, they’ve more or less left Henry to figure some distressingly dangerous things out all on his own. Initially I thought there must be a reason for this trial-by-fire parenting style, but near the end when some attempt was made by Henry’s mother to assure him she’d done the best she could, I couldn’t find the explanations for familial non-disclosure at all satisfying. Side Note: Unfortunately, it truly chaffed at me to see yet another example of albinism being used as the prominent trait of a one-dimensional villain. The albino mutation is portrayed negatively enough in literature and pop-culture (in this reader’s opinion). On the whole, a serviceable option for those insatiable light fantasy fans. Wandmaker is an adventure packed book filled with family, friends and magic. After several attempts to get his wand to work Henry writes a letter to Coralis the author of his guidebook, unknowingly setting off a series of events that will change his life forever. Henry comes from two great lines of Wandbarers and he himself has great magic within him. Told in alternate points of views this is a story so brilliantly woven together, you would swear the author has a bit of magic himself. This novel is told from multiple points of view, and while in some stories this is hard to follow, Ed makes it work really well. We don't get lost or confused. Not to mention getting inside the heads of all the different characters, Henry especially, is something I am huge fan of. While I feel the story focused more on Henry, his budding powers, and his relationships, there was still a good balance for those looking for a bit more action. Henry and Brianna's relationship was among my favorites to see developed. We see them going from normal sibling rivalry to working as a team. The bond between them growing even stronger and is something I will be very excited to see in later books. Coralis Henry's mentor and the author of the guide book, is a crotchety old man who will make you laugh with his bizarre cursing (children appropriate), and his lack of knowledge about the world. His relationship with Henry is something I really enjoyed. His duty to protect the world brought him out of seclusion, but his relationship with Henry and the love they share makes him continue to stay. The questions left me wanting more. What can Henry do? Just how powerful is he? I would like to see what Brianna can do as well. And what are the different levels of Wandbarers? The fast paced movement of the novel, all the while giving us adequate character development, and beautiful family/friend relationships is definitely just part of the reason I would recommend this to young readers who love fantasy, magic and family bonds. 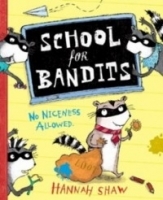 This story had a bit of everything from giant squirrels, to a bird who carries a backpack that will make even the non-readers jump on board with this story.